By the 1890s, the internal demand for Navajo weaving was almost non-existent. To make matters worse a widespread financial panic seized the US economy in 1893, depressing commodity prices for the raw wool that had come to replace weavings as the Navajo’s primary trade item. 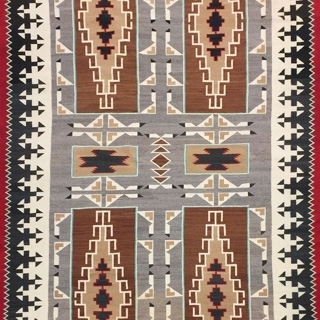 During this difficult time, several traders realized that there could be an external market for Navajo weavings made as rugs rather than blankets.The nascent market for Indian rugs was fueled at the turn of the century by a growing national interest in Native peoples and artifacts.Well-heeled tourists to the Southwest wanted unique souvenirs of the exotic places and peoples they visited, and rugs could easily be incorporated into the highly eclectic and overstuffed interiors of the period.The rug market was not limited to tourists, however. Many people who would never visit the Reservation appreciated the exotic designs and laborious handcraftsmanship of Navajo weaving. Proponents of the Arts & Crafts design movement found that the bold, geometric designs harmonized beautifully with their simple furniture and handmade accessories. Ada Kai - Monumental Navajo Klagetoh Rug with Handspun Wool c. 1980s, 172" x 111"
Ada Kai - Monumental Navajo Klagetoh Rug with Handspun Wool c. 1980s, 181" x 111"
Large Navajo Chinle Rug c. 1940s, 116" x 68"
Large Navajo Chinle Rug, circa 1940s, 143.5" x 108.5"
Large Navajo Ganado Rug, c. 1990, 142" x 100"
Large Navajo Klagetoh Rug by Ada Kai, c. 1970, 149" x 108"
Large Navajo Yei Pictorial Rug c. 1950s, 122" x 60"
Navajo Chinle Large Rug, c. 1940, 138" x 107"
Navajo Wide Ruins Rug, c. 1940s, 117.5" x 76.5"